I used to be the type who don’t “do” shopping. I only buy what I need most of the time – plus the occasional (impulsive) I-must-have-this when I spot something as I browse around in the malls. That meant for so long as I wasn’t physically at a mall/shop, I wasn’t spending on anything. Now, with everything at the tip of our fingers (thanks to the interweb) I can arrange my travels, order food and even get that dream dress that is on sale – all without leaving the comfort of an airconditioned room while it is sweltering outside. Yes. Of course I am talking about online shopping. But before that, Disclaimer: This post is in not encouraging you to spend billions of dollars online or be swamped in credit card debts. It’s purpose is to share with you how you can actually SAVE more money when shopping online. Just make sure you pay your credit cards bills on time! Or pay using cash. We good? Alright, continue. Now, I recently came across a website that actually pays you when you shop online. Actually, it gives you back a percentage of an amount that you spent when making online purchases. This is called CashBack. But, before I direct you to that website, allow me to answer the questions that are in your head right now. 1. What do you mean by CashBack? CashBack is getting back (in cash) a percentage of an amount that you spent when making purchases on an online Seller’s website. For example, if you spent $100 on the purchase of an item online and if cash back for that Seller is 10%, that means you will get back $10. The nett effect of that is that you actually spend only $90 (ie. $100 minus $10) instead of $100 on your purchase. Using the above example, you pay $100 when making the purchase as per the normal online shopping procedure. The $10 cash back will be credited into your CashBack account, which you can then get transferred into your banking account after a certain period. 3. Where does the cash come from? Good question and an important one. The $10 that you “get back” in the above example, is actually a part of the commission that the CashBack site receives from the Seller for bringing sales/ie. you (a paying Customer) to the Seller’s website. 4. Why would the CashBack site give me cash back? Well, since you are buying from the Seller and earning the CashBcak site Commission, why shouldn’t they NOT be giving you at least some of that commission? Seller gets Sales, the CashBack site gets Commission and you get the item you paid for PLUS cash back. Everybody wins. 5. Who should be register on the CashBack site? Honestly, if you are going to be spending that $100 in purchases, why not spend that but get $10 returned to you in cash back and thereby only spending $90? That’s $10 saved! Okay, now that you’re clear about the basics – let’s get you sorted to saving up with cash back. If you would like to register for a CashBack account, leave me your email address so I can invite you and you will automatically get FREE $10 (RM10 for Malaysia) cash back credit in your account: RM 5 when you sign-up/register and another RM5 when you make your first purchase. Happy shopping and Happy savings! Kuching, capital of the Malaysian state of Sarawak on Borneo, is a bustling, diverse city of old colonial buildings and modern towers – and it will come alive in 10 days with HashtagLive Kuching! 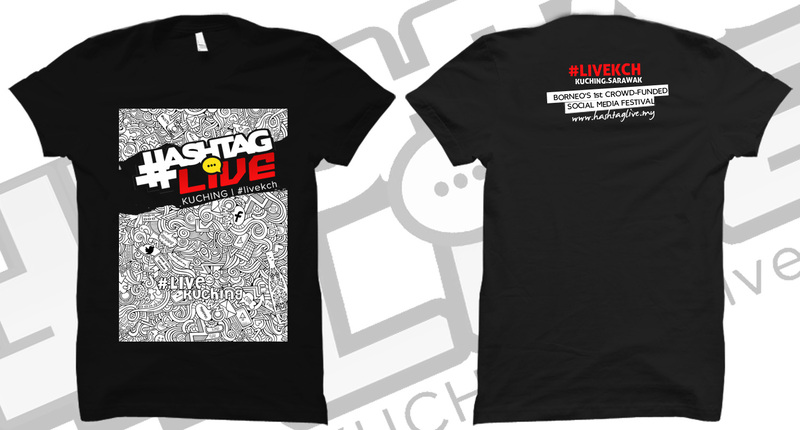 Happening on 12 & 13 September 2015, HashtagLive Kuching is a social media festival which will focus on the good use of social media. But for those of you who are in Kuching (or can make it there) you can anticipate to get to know local and up-coming youtube artist (Sarawakians and really talented! ), watch and play games/egames, visit a booth by your favourite online shop and check out indie brands at the LiveMarket! And you will get to do real social media stuff at the first of a kind social media area! There are also lucky draws, contest and more happening during the event. These 9 acts (I wrote about their Semi-Finals here and here) battled it all out in the Asia’s Got Talent (AGT) Grand Finals last night. There is no denying that these boys really do know how to rock! Performing “Final Countdown” to kick off the Grand Finals really brought everything into perspective of how it really is the final countdown to determining the winner of AGT. INTENSE! I wouldn’t be surprised if they grew up to became those long-haired tattoo-ed head-banging rockers who smashed their equipment at the end of their concerts! Oh dear, that’s not my kinda thing. Having breezed through the Judges Audition and the Semi-Finals with the Golden Buzzers, they are obviously the Judges’ favourite act – and who can ever complain about that? Eversince their audition, we have seen how their unconditional love for each other is really captured by their dance and last night’s performance really really really was the epitome of what they have consistently shown us at the competition. I had GOOSEBUMPS watching them last night! And the difficulty of the moves they did just blew me away! Last night’s performance was better than the Semi-Finals but to me, she hasn’t really found her identity and is still experimenting with her talents. Firstly, in the Judges Audition, she sang and played the guitar and I really loved her roar. Then, in the Semi-Finals, she sang more than she played (and her singing was off). And last night, she didn’t play at all but just sang instead. Yes, she has a great voice (though not perfect, there was a minor glitch I noticed at a point) but I wanted the original Gwen with the autographed-guitar. They did a wonderful job bringing Mongolia to us but that is expected for they are already professionals in what they do. They are a well-established band. They have already been travelling and performing all over the world (David Foster even referred to them as the “One Direction” of Mongolia) and so since the very beginning, I felt it unfair for all the other acts to be competing alongside them when they do not need to win this unlike the other acts. Imagine One Direction (proven talent, already famous, has the means to make it in the industry) competing with a lesser known act (never been heard of, needs finance to pursue their dream) – hardly fair right? They are known talents and they do not need a show to tell them that. And that is why my vote will not be going to them. From the very beginning, I always saw them as Duracell bunnies – especially when they do their fluid-yet-robotic moves in slow mo! Weirdly wonderful was used to describe them and they are indeed that. The only other act to have glided pass the Judges Audition and Semi-Finals (along with Gao Lin & Liu Xin) thanks to the Golden Buzzers, these guys never fail to tell an inspiring story or give a beautiful message with their shadow-play.They certainly did it again last night and touched us with their piece on Mother Nature. They are undeniably an inspiration to many in what they do and I am certain they will go far. She has a powerful voice and she knows it. However, I have yet to truly be blown away by her song-choice. I was hoping she would do a song from a musical (Phantom of the Opera or Les Miserables, for example) but at least she did “The Impossible Dream” – still better than the song-choice in the Semi-Finals I felt. I am pretty sure that if she does not win this, she will be signed up by David Foster himself. She is, afterall, his Golden Girl and he guaranteed she will go far. That said, she does not need to win this as her career is pretty much secured already – and that is why I am definitely not voting for her. From the very beginning, these groups of boys have been portrayed as coming from an underprivileged background and winning this competition would no doubt greatly assist them and their families. But while I enjoy their performances, they never really blew me away with it. I wish them all the best for the future. They can only get better. But for the moment, for the now, talent-wise, I feel other acts deserve this win more. At the end of it all, I applaud all of them for bringing their BEST performance yet seen in the competition but I am not looking forward to having to choose only ONE to vote for to win Asia’s Got Talent! And at this point, my vote is torn between Gao Lin & Liu Xin OR Triqstar as I feel it will count more towards either. Voting has opened since last night and will close by Monday, 11th May 2015. I still have a few days to deliberate…who do YOU think should be the Asia’s Got Talent winner? Voting on Facebook is free. Sada Borneo (AGT19) brings Malaysia into the Semis! And now, Sada Borneo made it into the Semi-Finals – the only act from Malaysia shortlisted along with 23 other acts from other countries out of the thousands that auditioned! Woohoo!!! Malaysia and Borneo represent! Will they make it to the Finals and be that much closer to being the winners??? YOU can make it happen! Just download the app (available on the App Store and Google Play) and start voting. You can purchase 1, 3, 25 or 100 votes at a click of a button. (WOW!) Read the Terms&Conditions for more information on purchasing votes and voting. 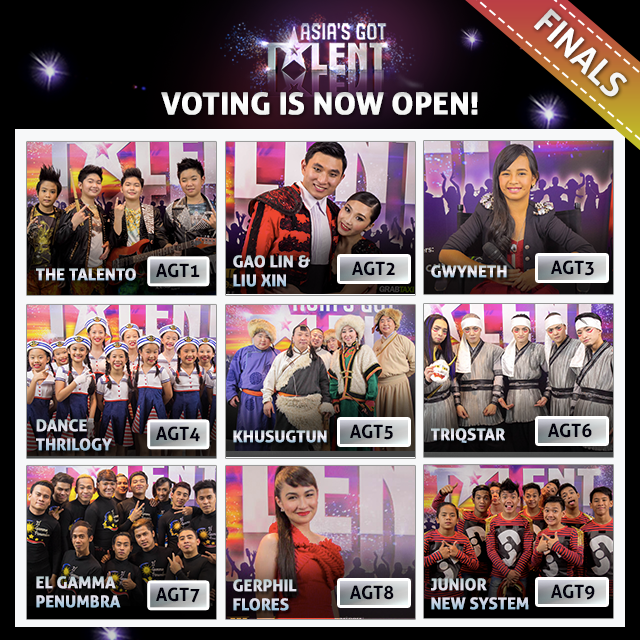 We already know Gao Lin & Liu Xin (China), Triqstar (Japan), Gwyneth Dorado (Philippines) & Junior New System (Philippines) have been shortlisted to be part of the Final 9 Acts competing for the coveted title of being the first Asia’s Got Talent winner. So come on Malaysia (and Borneo!) 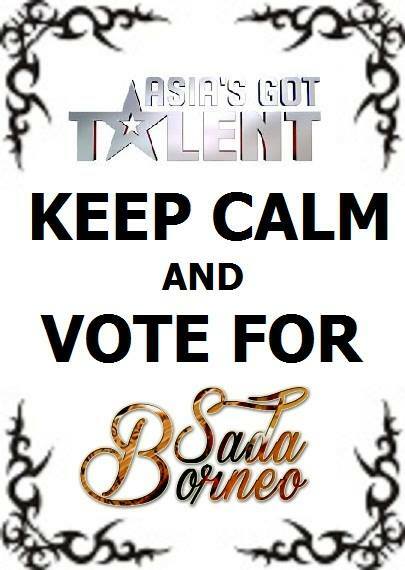 vote SADA BORNEO to represent us in the FINALS! Posted in Events and Occassions, Friends and Family, Music and Movies, News, Personal	| Tagged Asia's Got Talent, Borneo, Malaysia, Sada Borneo | Comments Off on Sada Borneo (AGT19) brings Malaysia into the Semis!